Registration is now open for the 2018 Pastor & Spouse summits. These events are held every two years for senior pastors and spouses from UB churches. The denomination covers the cost of lodging and a few meals. Here are the dates. April 9-12, 2018 (Monday – Thursday). Summit for senior pastors and spouses from churches with an attendance above 300. April 16-19, 2018 (Monday – Thursday). Summit for senior pastors and spouses from churches with an attendance of 150-300. April 30 – May 3, 2018 (Monday – Thursday). Summit for senior pastors and spouses from churches with an attendance less than 150. Begin Monday evening and end Thursday after breakfast. No cost to the pastor for Monday night through check-out Thursday morning. You are responsible for transportation to and from the Summit. The National Office will be available to assist with carpooling arrangements. Each local church is encouraged to provide travel and meal expenses for their pastor to attend the summit. Each Pastor & Spouse Summit qualifies for 20 credit hours of continuing education. In addition, two summits will be held specifically for ministers serving in staff roles. Registration for these events will open in early 2018. April 23-27, 2018 (Monday – Friday). UB Youth Summit. May 7-11, 2018 (Monday – Friday). Summit for UB associate staff. The gravestone of Rev. 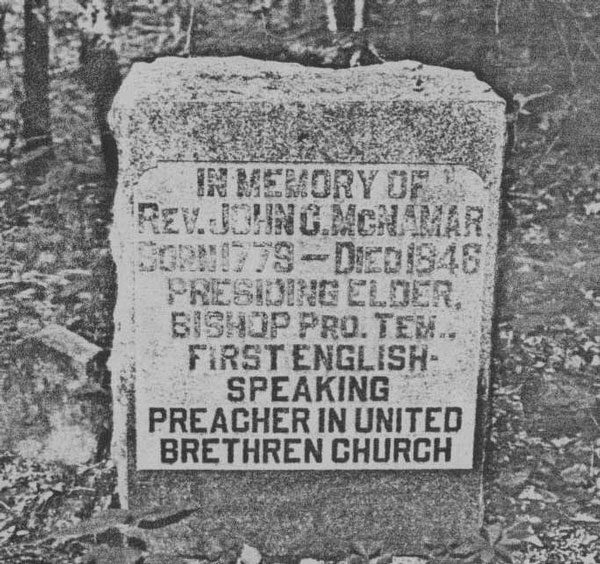 John McNamar, the first English-speaking UB preacher. John McNamar was married December 19, 1805, in Xenia, Ohio. 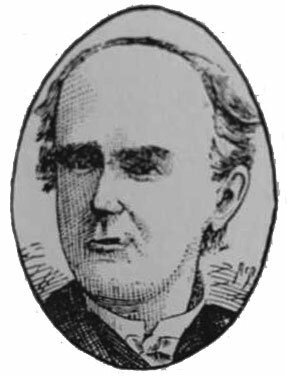 We can assume they said their vows in English, because McNamar is heralded as the first English-speaking United Brethren minister. Says so on his gravestone. All of the founders and early ministers spoke German. 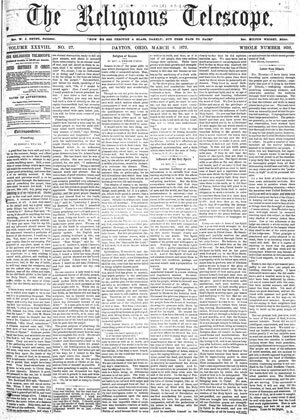 But in the early 1800s, most of the church’s westward expansion occurred among English-speaking people, and McNamar was in the forefront. McNamar was born in Virginia in 1779, of Scottish-Irish descent. It’s not know when exactly he moved to Ohio. However, in 1811 he became a schoolteacher in Germantown, Ohio, where future bishop Andrew Zeller lived. 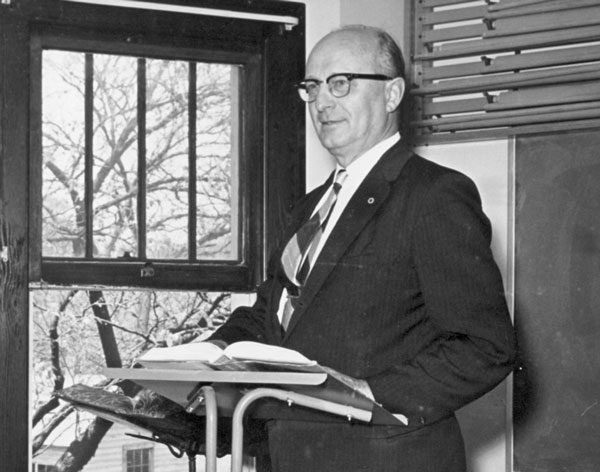 He became a Christian during an evangelistic meeting in Zeller’s barn, and Zeller shepherded im toward the ministry. In 1814 he became a minister in Miami Conference (the Miami Valley of southwestern Ohio) and was ordained in 1816. John Lawrence wrote, “He devoted himself to the Master’s work with a singleness of aim, and resoluteness of purpose, which have seldom been equaled. 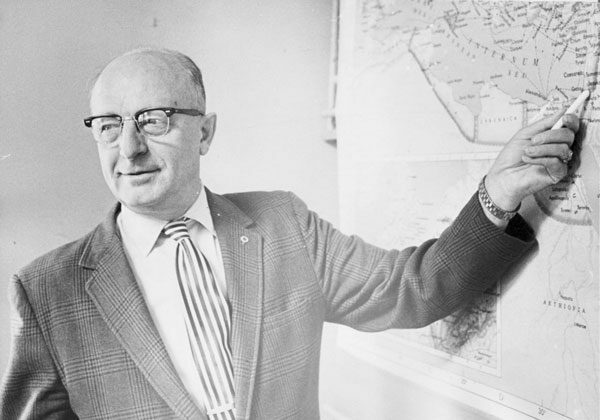 He planted the larger part of the early English United Brethren churches in southwestern Ohio and southern Indiana.” He was also successful in recruiting new ministers. By 1820, another eight English-speaking ministers had joined Miami Conference and were doing their own part in spreading the Gospel. McNamar toiled faithfully for over 30 years. He passed away in 1846. The Roseville church crash site. Randy Magnus amidst the rubble of the sanctuary. 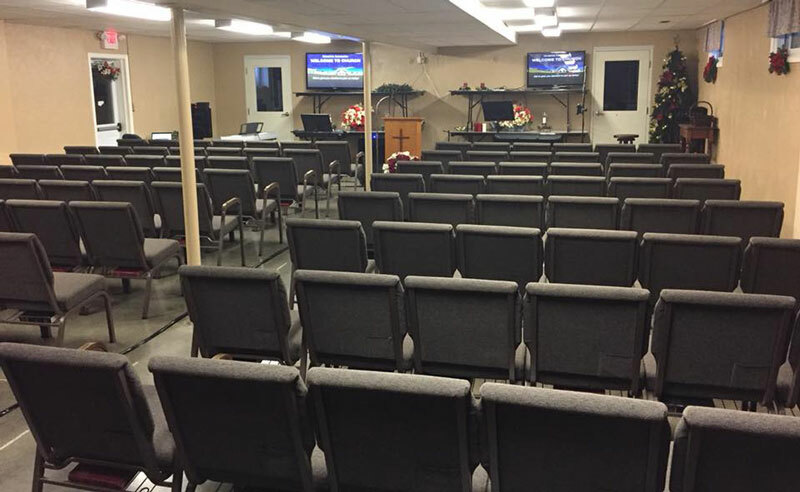 Chairs set up in the fellowship as a temporary sanctuary after the crash. On Saturday, December 16, Pastor Randy Magnus conducted the funeral for Marie Savaria, 62. He had never met Savaria, and she had never attended his church, the Roseville UB church in Ayr, Ontario. It’s quite a story. Savaria, a former nurse and hospital manager from Kitchener, Ontario, was on her way to visit her mother in a nursing home. About a month earlier, she had blacked out while at home; she had a medical scan scheduled on December 12 to determine what might be going on. Now she blacked out while driving. As she fell unconscious, her foot pressed the accelerator. 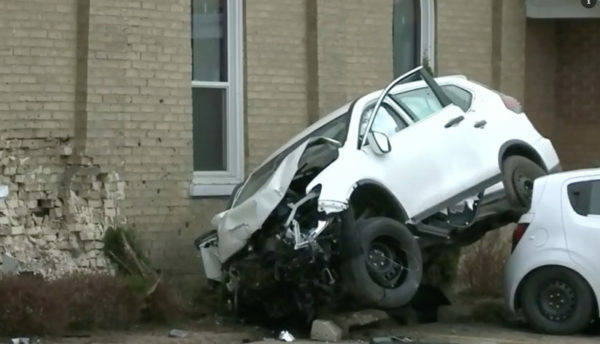 The Nissan Rogue SUV swerved into a ditch and then went airborne, crashing into the side of the church at over 60 miles per hour. Chris McElroy, the church janitor, was standing on the church stage about five feet from where the SUV hit. He ran outside and helped pull Savaria from the smoking car, which had fallen atop his own car in the church parking lot. She died in the crash. It was about 2:00 pm. Now for the uplifting part. Savaria’s daughter, Kelly Henderson, flew from her home in British Columbia to Ontario. 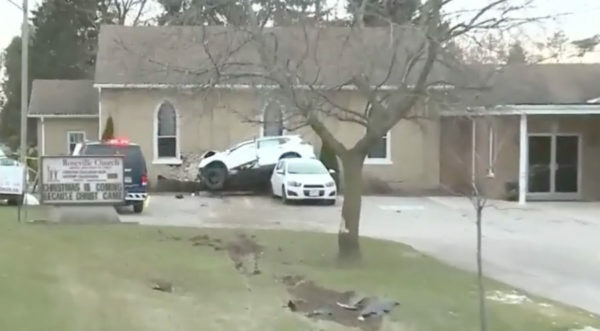 She wanted to see the crash site, so a police officer drove her to the church on December 10. The congregation was having a fellowship time after the worship service. Pastor Magnus and Wilf Witzke, who witnessed the crash, went out and spoke to them, offered comfort, and prayed with them. Since the family had no church connections,Henderson asked Pastor Magnus if he would preside at a celebration of life service for her mother. He gladly agreed. He was able to spend time with the family, hear many stories of Marie’s life, read Scripture with them, and pray for them. 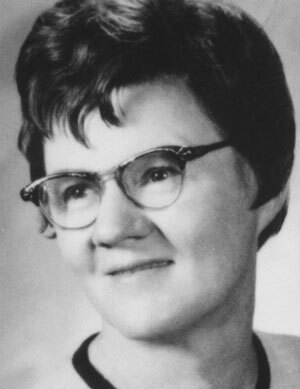 Henderson also asked that memorial gifts for her mother be channeled to the Roseville church—a church her mother, a non-practicing Catholic, had never attended. The funeral was held on Saturday, December 16. The church started out in 1881 as a Lutheran church, was sold to Methodists, and ended up in United Brethren hands. 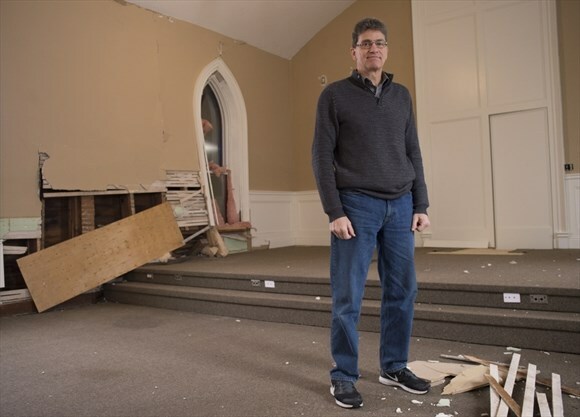 When the crash occurred, the congregation had just completed $10,000 of renovations. The crash caused way too much structural damage. 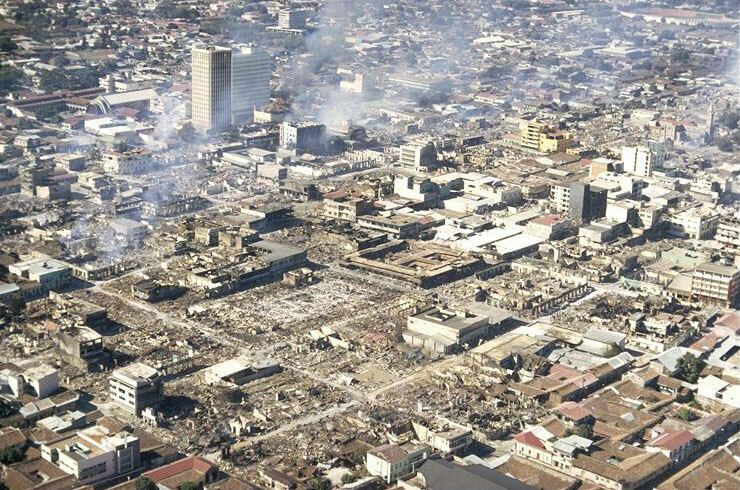 The impact transferred through the platform to affect the far wall, shifting both the north and south walls off the foundation. Construction engineers said the foundation would need to be rebuilt, but doubted that the church would gain approval to rebuild in the same spot, since it was located so close to the road. Seven churches in the area offered to share their facilities with Roseville UB, but that won’t be necessary. They set up 130 chairs in the fellowship hall, located in an undamaged Christian education wing built in 1974. They will hold services there until the new building is ready. 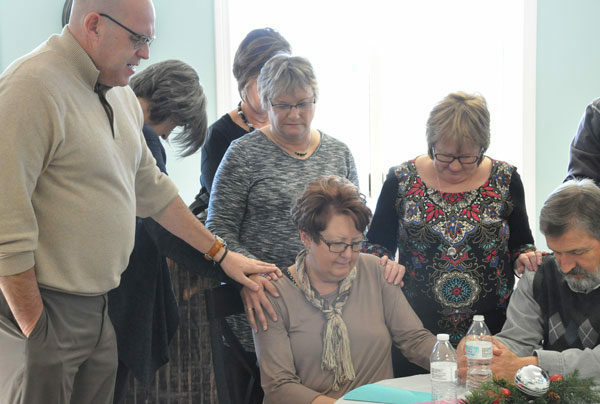 The National Office staff gather around Jane and Rod Seely as Bishop Todd Fetters (left) prays for them. 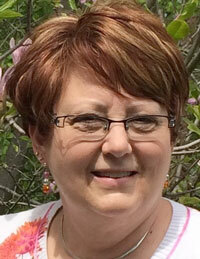 Jane Seely has concluded eight years of work at the United Brethren National Office. She came to the office in January 2009 as the part-time shipping clerk, and in May 2011 was named fulltime manager of Church Resources, our curriculum marketing and distribution operation. With the decision this fall to discontinue the marketing operation, Jane’s position was no longer needed. Jane saw it coming, and accepted the decision with the utmost graciousness. Jane grew up in the College Park UB church in Huntington, Ind. Jane and her husband, Rodney, now attend First Nazarene Church. Rodney is a sales rep for a building materials wholesaler. Jane graduated from beautician’s college in 1977, and worked as a cosmetologist in Huntington until joining the National Office staff fulltime in 2011. In addition, she makes jewelry, which she frequently displays and sells at fairs, craft festivals, and other events. The National Office held a farewell luncheon for Jane at the beginning of December. A few days later, she started online classes to become a Health Coach/Life Coach, and is very excited about this new chapter in her life. We appreciate Jane’s years of service to the churches of our denomination, and the cheerful spirit she brought to the office. She will be missed.